→ Why is an Employee Identity Card of Crucial Importance in an Organization? The first thing that you get when you join an organization is an employee ID card. Yes, apart from plenty of other documents, this card is something that you will have to always carry with you when you are in the office. Its conclusive proof that the person carrying the ID card works for the particular organization, and all the security personnel need to do is check the ID and the let the person through into the organization’s premises. In most organizations, not all employees have complete inter departmental access. Also there are some rooms/floor/cabins/amenities/facilities that cannot be accessed by everybody, and an employee ID card helps determines who has access to what. Every employee wants to “belong” to the organization that they join and these cards exude this sense of belonging with not just the organization but also the members of the organization. The fact that they feel a part of this organization means it gives them an impetus to perform better. This is good news for any organization. 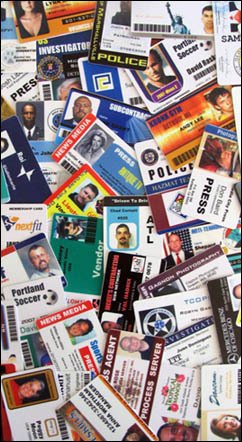 Plenty of ID cards are also a way of keeping track of an employee’s in and out times. The card needs to be swiped right at the entrance to the premise or the respective department’s door. This means employees don’t have to sign a register or something so that the management can keep track of their entry and exit times. With the help of such cards, this becomes an automated process. Some of the bigger organizations out there offer their employees a lot of perks. These are in the form of restaurant discounts, ticket discounts at movie theatres and many others. Employees of an organization get access to these discounts by showing their ID cards. God forbid if something bad were happen to you, like an accident or robbery or a medical emergency or something else, your employee ID card can also serve as a personal ID card. Most cards have personal information about the employee like contact address, whom to call in case of emergency, blood group etc. Employee ID badges are an intrinsic part of the work culture of any and every organization. The scope of the ID card and all that it represents changes from one organization to another; so while somebody will make a card an important part of the performance evaluation process of an employee, somebody else might just consider it a security feature that is just one of the many ways in which an organization is made more secure. These are just some of the many reasons why an ID card is important for any organization. As can be seen, this card/Badge plays multiple roles all of which in some way or the other help the employee and the organization as well.